On March 19, 2019, St. Petersburg hosted the annual Bioenergy Congress, where the industry participants discussed the current situation in the Russian and international markets. At the congress, Marina Zotova, Consultant of WhatWood Timber Industry Analytics Agency, presented a report titled “Russian wood pellets market 2018: production, sales, trends, existing facilities, and announced projects”. The report was based on the data of the recently completed WhatWood’s study “Russian pellet market”. The study shows that although wood pellets are classified in Russia as high-tech products (by Order of the Ministry of Industry and Trade No. 1993 of June 23, 2017), their share in the cost structure of timber industry production range and exports does not exceed 1%. In 2018, the volume of exports from Russia reached 1.5 million tons, which is 7% more than in 2017. In monetary terms, exports amounted to $186 million. Export flows have shown positive dynamics over the past 5 years. Exports have increased by 72% in volume and by 47% in value. The difficulty of determining the market volume is complicated by the fact that the official statistics provided by Rosstat does not reflect the results of small, medium-sized enterprises, and sole proprietors. Therefore, the actual production volumes are somewhat higher than the official statistics. According to WhatWooad’s estimates, 1.8 million tons of wood pellets were produced in Russia in 2018, 300,000 tons (about 17%) of which were sold domestically, and other 1.5 million tons were exported outside the territory of the Russian Federation. The market value reached 14 billion rubles, of which only 2.3 billion rubles can be accounted for domestic consumption. The total capacity of all Russian wood pellet plants is 3.6 million tons of finished products per year, but the average load of plants is only 50%. Most of the pellet enterprises are located in the North-West of Russia (Leningrad, Arkhangelsk, and Vologda regions, Karelia). volumes. There is an obvious pellet production development trend in the Far East (functioning lines of Asia Les LLC and JV Arkaim, the RFP Group enterprise under construction), which is primarily due to the attractiveness of exports in the Asian direction. Russian wood pellet experience shows that companies which are not integrated with sawmill enterprises have serious raw material risks. According to the consultants of WhatWood, further development of production capacities in Russia will continue to follow the “sawmill + pellet line” scheme. It will be especially relevant for the projects implemented within the framework of the forest sector priority investment projects program. Recent legislative changes oblige investors to dispose wood waste (there was no such provision at the dawn of the priority investment projects mechanism). The time of autonomous and independent enterprises is running out. This approach will allow to recycle sawmill waste and increase the profitability of sawmilling. 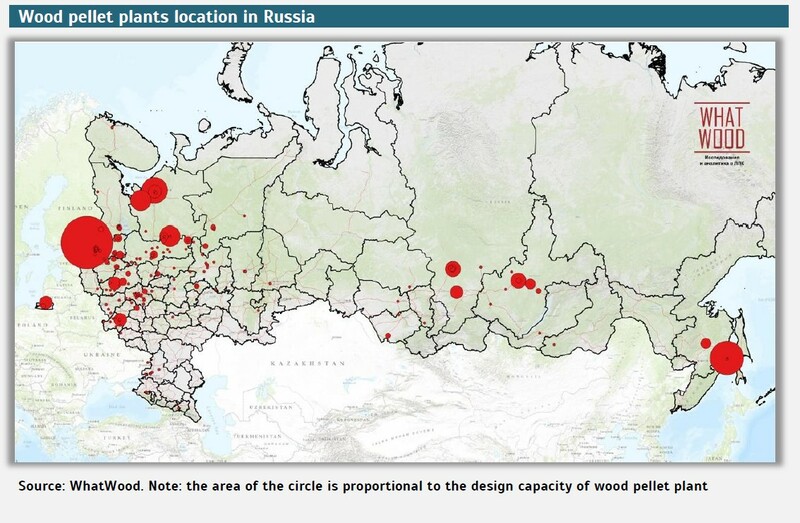 There are about 300 wood pellets production enterprises of different scales in Russia. Most of them are small private companies with the annual output of up to 20,000 tons per year. Their total capacity is 710,000 tons (85% of the recorded pellet capacity). The others are large and medium-sized enterprises with the annual production capacity of over 20,000 tons. It is important to note that in 2018, 80% of the total wood pellets output in the country was produced by 30 companies. 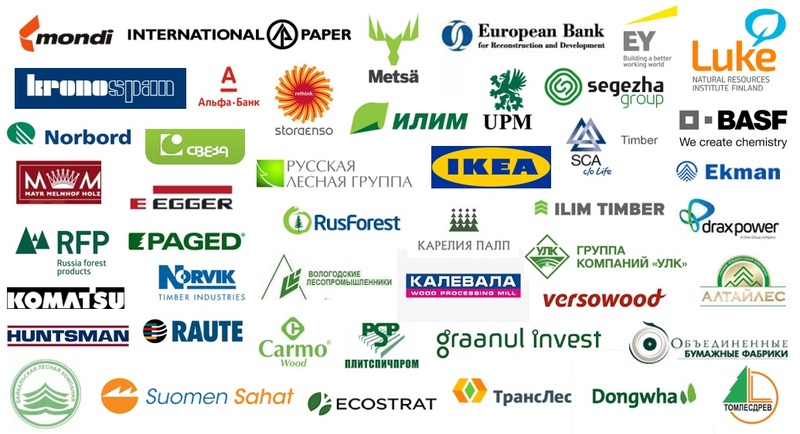 30% of the market is controlled by 3 forest group of companies. Analysis of the competitive environment by the Herfindahl-Hirschman Index (its value for 2018 did not exceed the figure of 1000), allows to categorize the Russian pellet market as a market of low concentration (monopolization). This allows to conclude about the free competitive environment in the market. The year of 2018 was marked as the period of the most favorable prices for producers in recent years. The average producers’ wood pellet sale price, according to official statistics, amounted to 7700 rubles/ton (104 euros/ton). Average prices in rubles increased by 40% compared to 2017. The increase in prices was primarily influenced by favorable market conditions in export markets: contract prices of exporters were growing during the year, sale prices reached their peak in recent years. Secondly, the rise in prices in rubles was caused by the weakening of the ruble in 2018 – by 8% against the USD, and by 12% against the euro. The containerization of finished products deliveries is obvious in the market. In 5 years, the volume of container traffic has doubled. It’s worth noting that there were no deliveries in containers from Siberia or the Far East in 2013 yet. In 2018, 20% of the total volume of wood pellets were transported from Siberia and the Far East already in containers. According to WhatWood’s estimates, the share of transportation in containers will continue to increase: first of all, it reduces the time required for loading of products; secondly, it solves the problem of polypropylene packaging disposal which is highly important today in view of strengthening of environmental trends in the use of plastic and other “non-green” materials; thirdly, it resolves the problem of air dustiness during the transshipment of pellets on board of ships, and, finally, it provides for delivery of products directly to the buyer in the premium segment. However, the trend of “containerization” is relevant primarily for the premium segment pellet market. Detailed description of the market situation on the pellet markets, prices on markets, contract prices for exporters (for specifications), power output at operating and announced wood pellet projects, forecast of market development till 2025, contacts, manufacturers, traders read in a new analytical study “The market pellet in Russia” of WhatWood agency.